IS THIS YOUR CHILD? These are the major symptoms of potentially unrecognized allergies. Does your child suffer from any of the following? 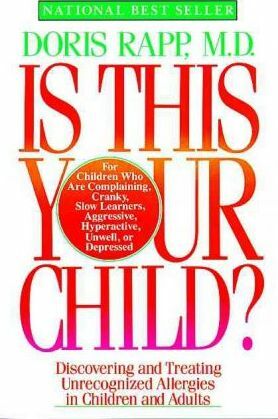 - Allergic Nose Rub - Eye Circles - Red Ears - Red Cheeks - Eye Wrinkles - Aggression - Lack of Alertness - Mottled Tongue - In this breakthrough book, Dr. Doris Rapp offers a simple yet effective approach to handling "problem" children. Is This Your Child? shows parents how to identify the common foods, chemicals, or common allergic substances that could be the culprits that cause some children or adults to feel unwell or act inappropriately. If your child is always sick, hyperactive, a slow learner, or cranky, the first question you should ask is not "What drug should be prescribed?" or "What have I done wrong as a parent?" Instead, find out the cause. Dr. Rapp gives sensible suggestions about how these reactions to foods and environmental factors can be recognized, prevented, and treated. With this information, many affected children should feel, act, behave, and learn better. If you can detect unsuspected environmental illness in your child--or yourself--you can change your lives so you're more content, happy, and free of illness.